« How Can Armac Help You This Autumn? Why Choose Armac Stump Grinding? Tree removal, stump grinding and yard cleanup are all jobs that may be tempting to tackle as a home DIY, but are definitely best left to the professionals. Not only are they dangerous from a safety perspective, they are also labour intensive and require a degree of expertise in understanding the best way to tackle the job to save time and money. Armac are your experts in stump grinding, tree removal and yard cleanups in the South West. Local specialists operating under strict safety guidelines and standards, Armac Stump Grinding are reliable and professional, with competitive pricing and a range of yard services to satisfy all of your needs. As a family owned and run small business, Armac understand the unique challenges and joys of living in the South West and the types of vegetation and domestic flora we enjoy. Ray and his team utilise their years of experience to efficiently and carefully remove trees, shrubs, bushes and old stumps to make way for new growth and development, whilst being sensitive to the ecosystem of our local community. Armac carry all necessary accreditations and insurances to ensure they not only carry out the job professionally and to the highest safety standards but will be compliant with your own insurance requirements. We place the highest importance on safety and focus on completing the job safely every time. 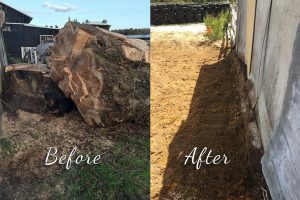 The size, location and situation surrounding the stump, tree or yard will determine the cost of the job, however Armac Stump Grinding are always fair and competitive with their pricing. We understand the growing cost of maintenance of your property and strive to keep our prices indicative of the work involved without compromising on customer service and workmanship. 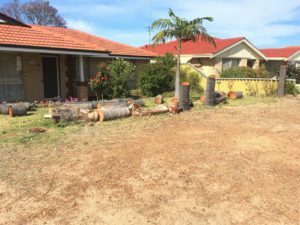 Who Can Assist Me With Tree Removal, Stump Grinding and Yard Cleanups in the South West? Armac are so much more than just stump removal specialists, they can assist with all areas of yard cleanup and tree removal. Call Ray and the team on 0448 442 477 for your free quote today.